Letter to an unknown soldier Jump to media player People from around the world have been invited to write an imaginary letter to the statue of a soldier at London's Paddington Station. Queen honours WW1 volunteers Jump to media player The Queen has attended a service to honour volunteers who served in World War One, on the 100th anniversary of events that led to the outbreak of war. Century since death of Franz Ferdinand Jump to media player The 28 June 2014 marks 100 years to the day since a young Serb nationalist shot dead the heir to the throne of the Austro-Hungarian empire. EU leaders gather for WWI memorial Jump to media player EU leaders have held a ceremony in Ypres, Belgium, on the 100th anniversary of the start of World War One, ahead of an EU summit. E3: WWI letters inspire video game Jump to media player Letters sent back from troops in Word War One inspire a video game from Ubisoft that offers insights into the emotional toll wrought by the conflict. WWI 'miracle' helmet returns to Flanders Jump to media player A helmet which saved the life of Orcadian writer Eric Linklater in World War One returns to Flanders for commemorations of the conflict. British soldier who saved Hitler? Jump to media player Inside Out examines the claim a British soldier spared Hitler's life in World War One when he could have killed him. A memorial built from words rather than bronze and stone is being built to commemorate the start of World War I. People from around the world have been invited to write an imaginary letter to the statue of a soldier at London's Paddington Station. More than 6,000 people - including Prime Minister David Cameron, Stephen Fry and Sheila Hancock - have already written their letters, which will form part of a permanent collection online, being put together for 1418 NOW - a major cultural programme taking place across the UK to mark the centenary of the war. 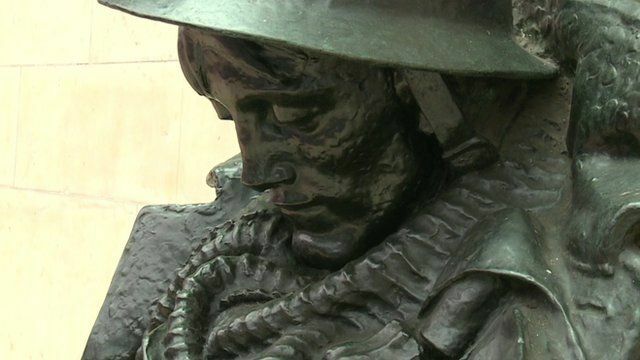 Former Poet Laureate Andrew Motion read his letter to the unknown soldier for BBC News. This is part of 1418 NOW which is being produced in association with the BBC.